Councilman reports how dozens of rioters almost caused huge disaster in French Hill neighborhood as they destroyed a gas station. During the course of intense Arab rioting in Jerusalem on Sunday, Jerusalem Councilman Aryeh King reports that a massive explosion was miraculously averted in the north-eastern neighborhood of French Hill. King arrived at a gas station in the Jewish-majority neighborhood on Sunday night, and reports that dozens of Arab rioters attempted to ignite the fuel reserves in what potentially could have caused a huge blast. "Muslim terror is raising its head in French Hill," King told Arutz Sheva on Monday. "A huge disaster was averted yesterday towards midnight, when no fewer than 40 Arab terrorists broke in to the French Hill gas station and tried to set off the fuel stores." If they had been successful massive damage would have been inflicted on the adjacent homes, notes King, who just last Friday was dismissed by Jerusalem Mayor Nir Barkat from his position in the municipal coalition, after he petitioned against building plans for Arab residents that he argued threatened the demographic balance of the capital. Speaking about the rioting, King noted "the Jerusalem police of course were not on the scene, despite earlier information on expected disturbances and despite the (gas) station being at the front line to the adjacent (Arab) neighborhood of Isawiya, from which dozens of Muslim rioters have emerged in recent months." 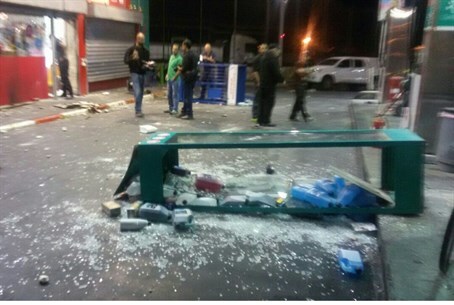 The Arab rioters threw rocks and molotov cocktails at the gas station, destroying the store located there. They damaged the fuel pumps and security cameras, stealing oil from the station and spilling it on the road leading to Isawiya before fleeing the scene. Firefighting crews managed to put out the fires the rioters lit in their attempt to blow up the gas station, and the oil on the road was covered with sand to prevent cars sliding out of control and crashing. The rioting started in Jerusalem's Wadi Joz neighborhood on Sunday following the death of Mohammed Abu Sankara (16), who was injured during another riot a week earlier. Police say Sankara was shot in the leg with a sponge round while taking part in the violent riots, then fell and hit his head as he ran away; they add he was conscious as he was taken to the hospital. Sankara's family has alleged he was shot in the head at close range by the nonlethal sponge round. A Jewish youth was lightly hurt by the rock throwing in the riots, and likewise damage was inflicted on several vehicles by the Arab rioters, who in addition to rocks lobbed fireworks at police.